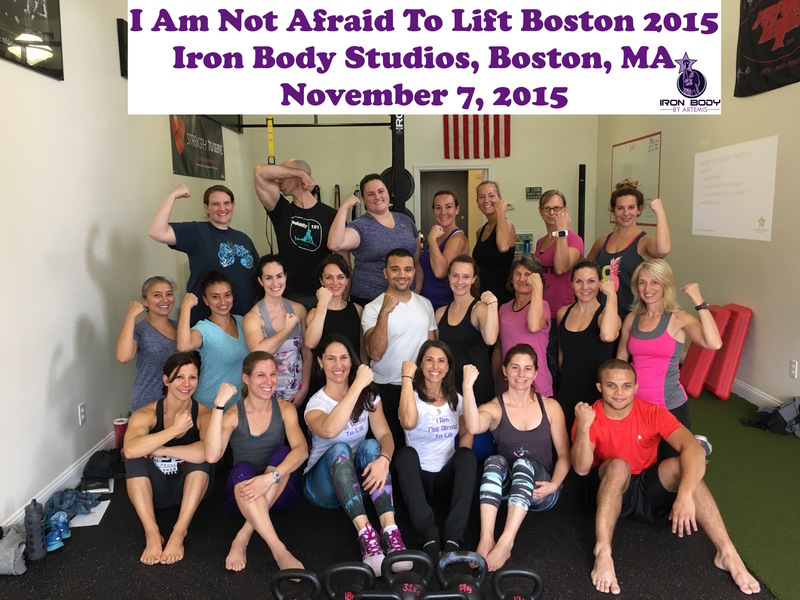 See what people are saying about I Am Not Afraid To Lift!! 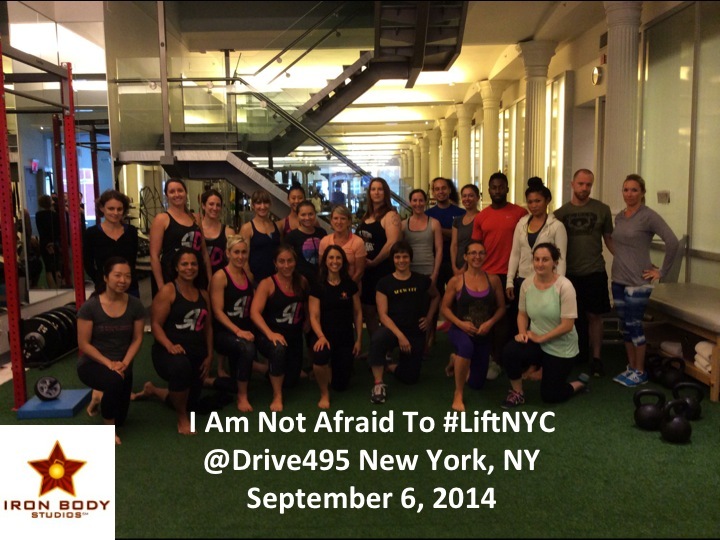 I met Jessica Merritt last year I Am Not Afraid To Lift NYC 2014 when she and her husband Chris attended the workshop at Drive495. At that time she was just getting into lifting, knew little about kettlebell training, and what she was truly capable of in the weight room. 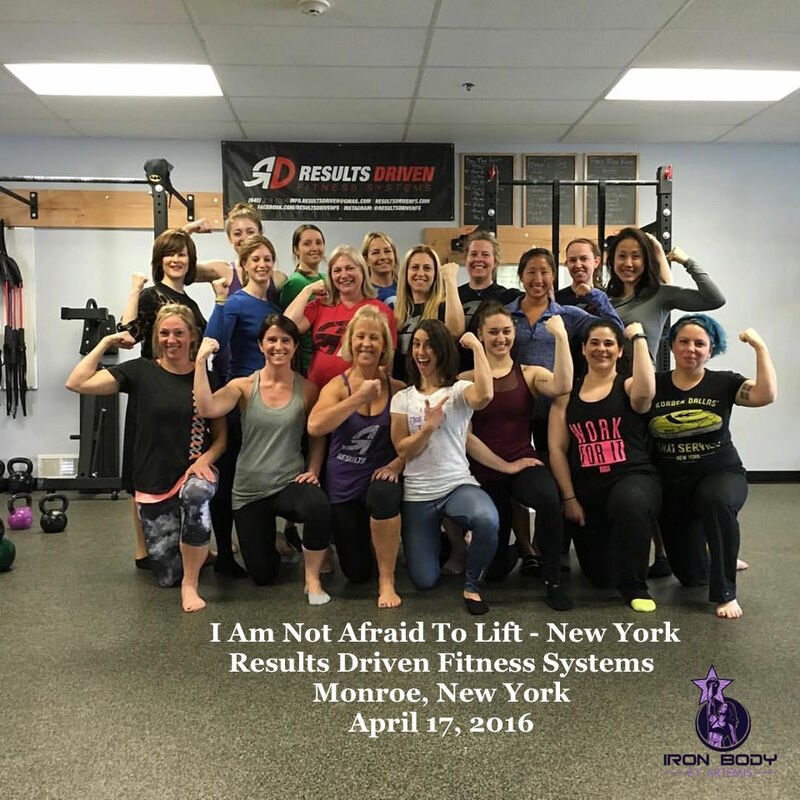 By the end of the day at Lift NYC 2014 she discovered that she could do a weighted pull-up with 10kg (22lbs) and she decided that she was going to get her StrongFirst Level I Kettlebell Instructor Certification. 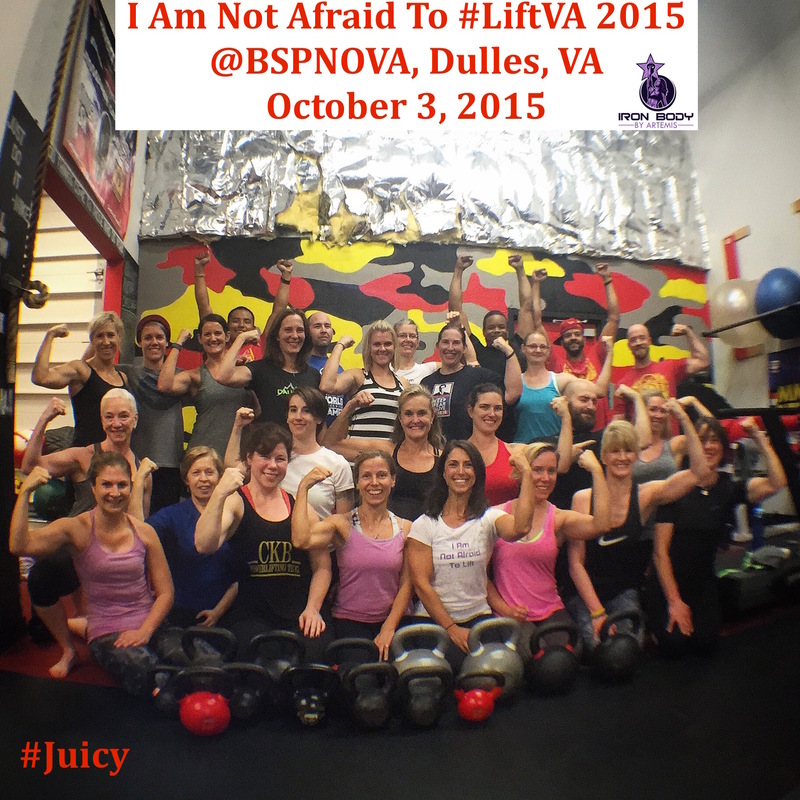 On October 3-4, 2015 she and her husband Chris hosted I Am Not Afraid To Lift at Chris’ training gym in Dulles, VA Beyond Strength Performance NOVA. 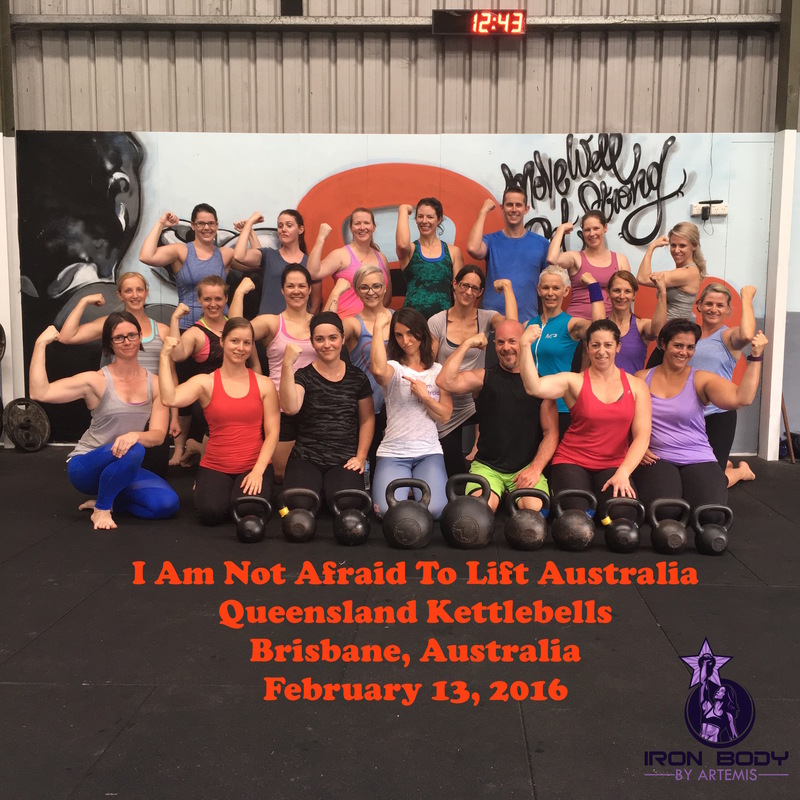 One year later at I Am Not Afraid To Lift VA not only is she a StrongFirst Level I Kettlebell Instructor but she also crushed a 16kg (35lbs) weighed pull-up at the workshop! 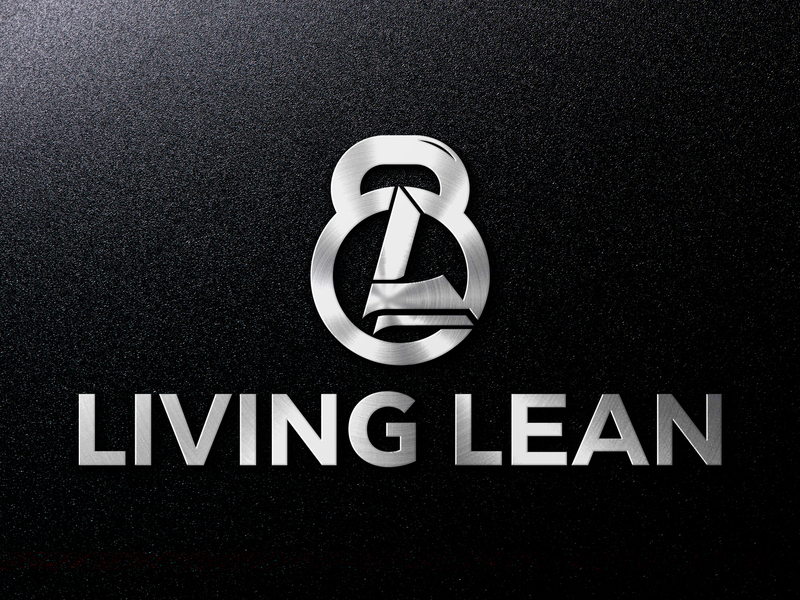 “I have been working out for many years now, but truly got into strength training in 2012. My husband, Chris, is a gym owner and he is always going to seminars. 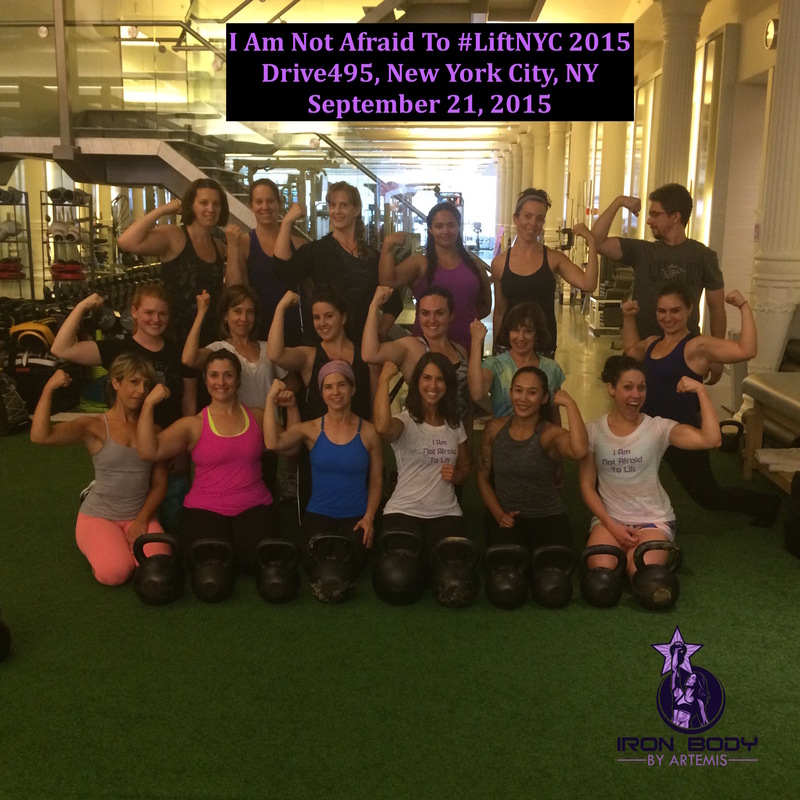 When he caught wind of the (very first) September 2014 NYC “I am Not Afraid to Lift” workshop by Artemis, he thought it would be a great idea for the both of us to go. 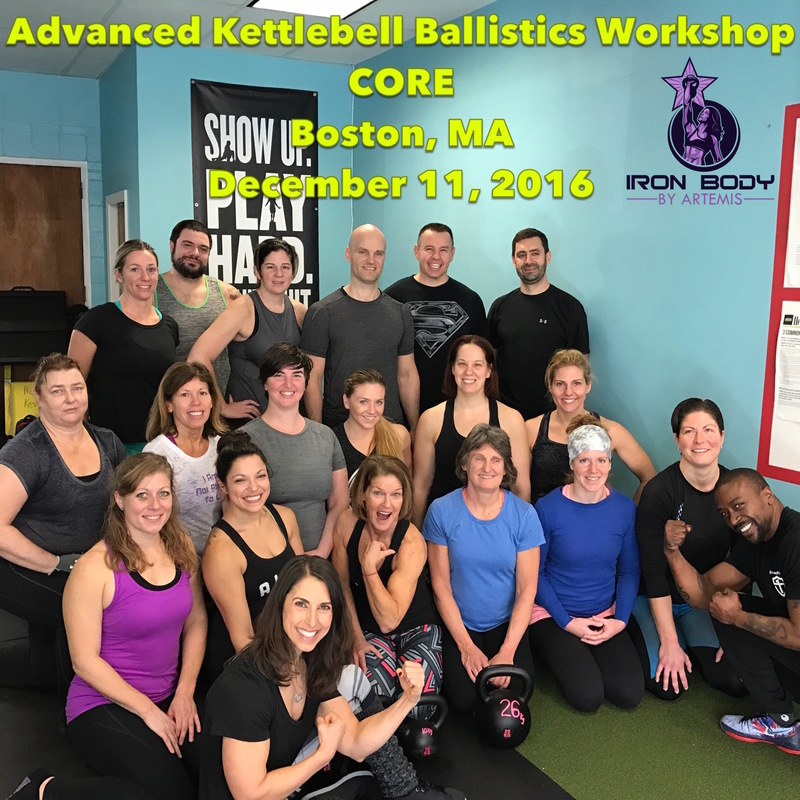 I was really excited about attending as I had very little experience training with kettlebells and was eager to learn more. I already knew I loved lifting and the awesome feeling that goes along with getting stronger, but I wasn’t, however, completely aware of what I was capable of. Artemis’s workshop certainly helped me in this aspect… I decided I would attempt my first-ever weighted pull-up with a 10 kg (22lb) kettlebell, after only having done my body weight before. First attempt was a success! I believe I also set a PR for myself when I double kettlebell cleaned 45lb bells (also a great feeling!). After the seminar, that very day, I decided I wanted to set specific goals for myself and begin training to obtain my Strong First Level I instructor certification. Within just a week or so of attending the NYC seminar, my husband and I were enrolled in the SFG cert course. Mission accomplished: we are both now Level I instructors, and I have to say that attending Artemis’s seminar is what set the wheels in motion for me wanting to learn more and see what other things I was capable of. 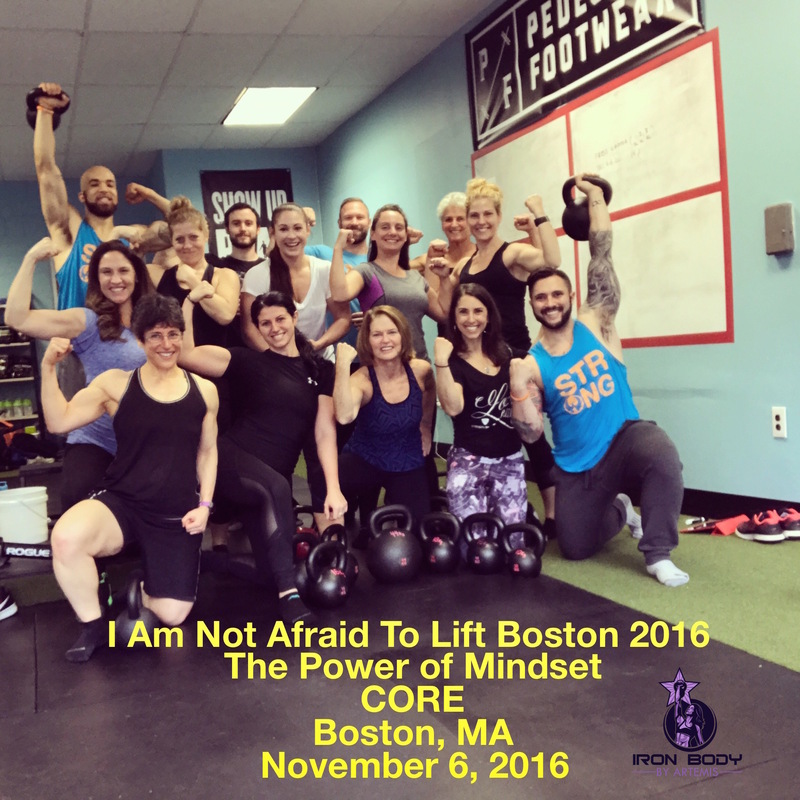 Almost exactly a year after attending her seminar my husband hosted Artemis at our gym, Beyond Strength Performance NOVA, where I was able to witness others (myself included, again) see what they were truly capable of. “Looking back, not only did I Am Not Afraid To Lift teach me some cool technique and programming, it really taught me to seek out, encourage, foster and disciple with other women athletes. A year ago I trained alone. Now I train with a woman partner. I go more out of my way to mentor female nurses, medical students, and residents, and to empower women who have all sorts of bodies and all types of goals. Honestly, I think I Am Not Afraid To Lift helped me to more clearly see the palpable value in putting that energy out there. Thank you. “The opportunity to challenge myself in certain exercises was fantastic. Artemis fostered a safe, yet motivating environment and this I achieved a 10kg weighted pull up for the first time. 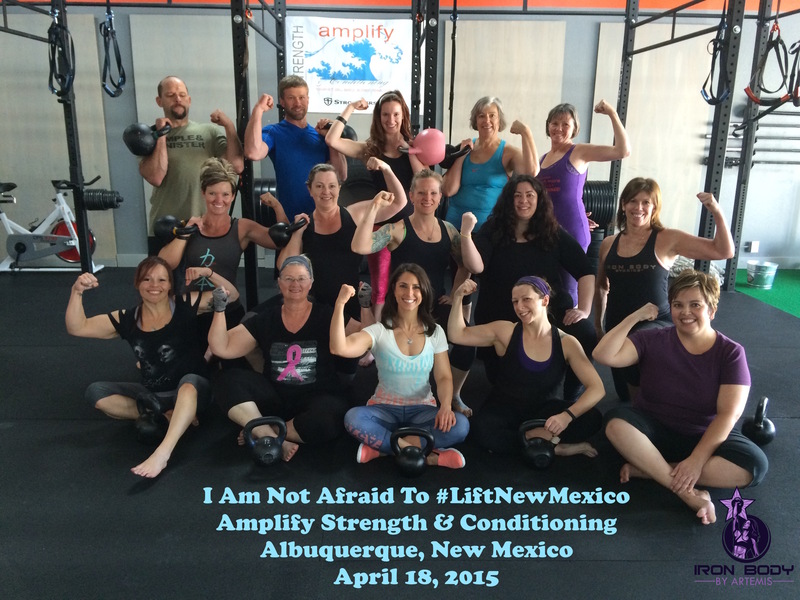 Read what MEN are saying about I Am Not Afraid To Lift! “I didn’t get a chance to come back to the gym on Sunday so unfortunately I couldn’t say this in person, but I want to thank you for a great day of training on Saturday. I got more than I hoped for out of the day (including bruises on the top of my feet from the baby crawls – that was a surprise), and I’m definitely sore today, but it’s a good sore and everything I needed to get kick-started into some strength training with kettlebells. I have a month of getting my muscle problems sorted out ahead of me, but I’ll be picking up my variable kettlebell again this week, and I also plan on buying more sizes this coming weekend. I don’t enjoy training in a gym – I’ve tried a few times but it’s just not for me at the moment – so Saturday gave me a lot of choice for my own home program. I’m going to start slow and low weight while I get my body fixed, then we’re heading to the States for a holiday, but after that I’ll pushing harder. I’ll let you know in 3 or 4 months how I’m getting on. I also have 10kg to lose to get back to my old weight from 2 years ago, so can’t think of a better way to get there. “The camaraderie between the women in the workshop was electric! It was really nice to be a part of a group of women who were there to empower themselves and one another. I learned even more than I thought I would — The way that Artemis provided us with several workouts + program design was a fantastic addition! I just want to thank you again for the work that you do. I haven’t come across too many workshops like yours, and I felt privileged to have attended. You rock!” ~Sarah F.
“I attended your workshop at QKB on the weekend but had to leave early both days so was unable to say thank you for your time, effort & knowledge over the weekend. I found the workshop to be very informative and valuable to my training. I really appreciate you speaking about your personal experiences and sharing the knowledge you have acquired over your lifetime of training and dedication. “The addition of Lisa with the psychology of goal setting and execution was such an awesome addition. Everyone plays such mind games with them self, but when you can identify how you can either create a positive mindset or when you’re falling into negative self-talk is such a powerful tool. Also as a fitness coach it is such a powerful tool to bring to your clients – great stuff!” ~Jen M.
“I came away from the workshop with information that will absolutely help me with my own training. I learned some new cues that will help me refine my technique and progress my strength. I feel like I now have a better grasp on programming workouts. 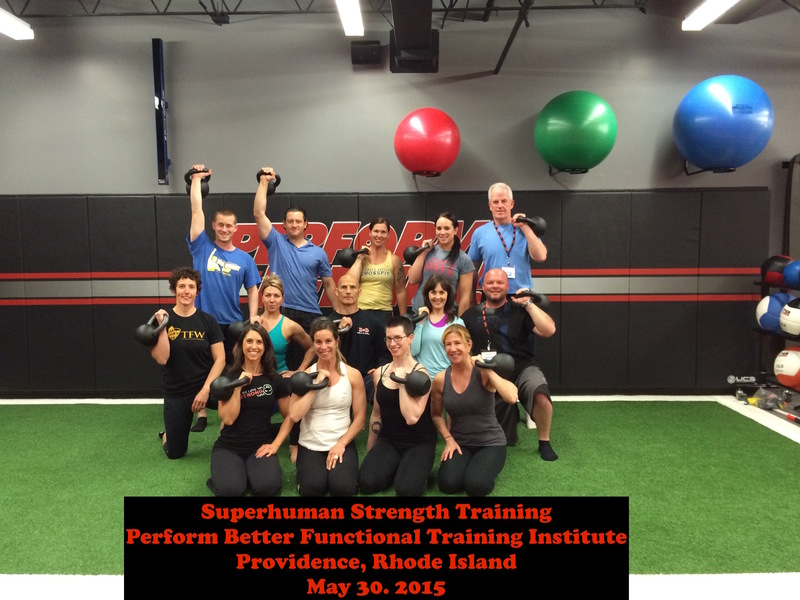 Lisa’s presentation was a fantastic complement to the lifting focus of the workshop. I now realize what an impact mindset has on training (and progressing) and am putting into practice what I learned. One thing I did particularly enjoy was watching people hit new PRs. It was inspiring to witness such accomplishments. The excitement and energy of the room was so positive. 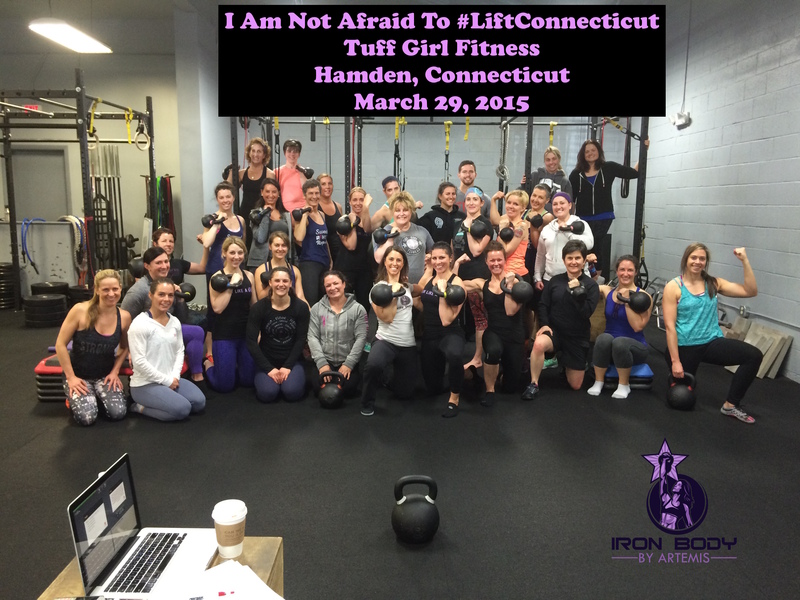 It was very cool to be a part of that.” ~Erin M.
“I honestly felt improvement in my pull up progressions today as I used the commands “tight, light.” I swear I went up so much faster! I also tried it unassisted again AFTER doing my modifications and got even closer than I did on Saturday. It’s right around the corner! I loved the overall sense of being with like-minded people and seeing so many people use good form (this can be rare at my YMCA). I have been a fan of Lisa for a while, so I knew her stuff would be great, but I was even more impressed and inspired than I realized I would be. I am totally sold on the idea that mental skills are a tremendously large part of training. Thanks for an amazing experience, Artemis and Lisa. Even though I’m not part of the “fitness world,” reading all the blogs and listening to the Podcasts has helped immensely in my strength training and fitness journey. It was so special for me to get to meet some of you and get some hands-on assistance. And thanks for arranging the social after, too – it was such a nice, personal touch! Hope to see you all again soon!” ~Ashley P.
“I learned a lot out from Lisa’s presentations, and I loved watching Artemis demonstrate the movements. Her videos are impressive, but watching it happen live and up close was an awesome experience for me. I liked the small number of participants, and pairing up with someone gave me an opportunity to get to know someone a little better. 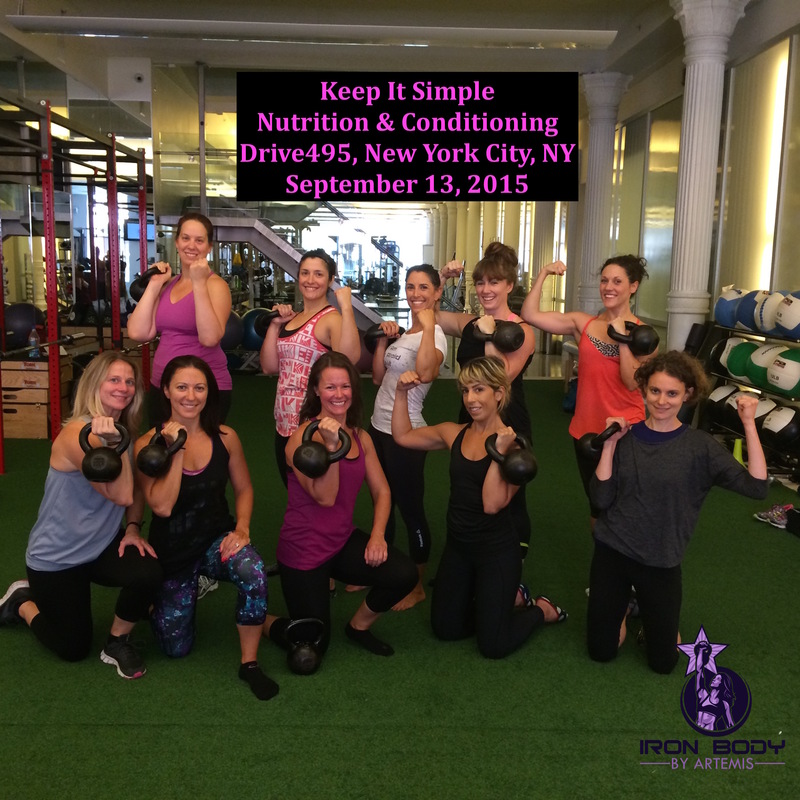 It was also wonderful to be in a fitness environment with so many like -minded females. Wait, I am not sure I am answering the question…my favorite “thing” was being in the presence of knowledgeable fitness professionals who were willing to take questions during their presentations. The small number of participants made me very comfortable asking questions. The coolest part for me was watching Artemis lift. Inspiring! When I consider the other presenters I have listened to, Lisa and Artemis are above average. Not only knowledgeable, but you were also very comfortable presenting your material…both Lisa and Artemis. Well done!” ~Mary E. S.
“I really liked the message of the workshop – to value your body for what it can do, and not just for what it looks like. I also liked how a wide spectrum of variations was presented for each exercise, showing us how to make the given exercise accessible to any client, regardless of their level of experience or physical capability.” ~Rebecca B. “I liked the personal touch with Artemis describing her “journey.” We each have our own but often share similar feelings and we are all striving to get to a better place.” ~Cathy M.
“I LOVE what came out of this seminar/workshop! I never anticipated the camaraderie, bonding and friendships that were just immediate. Artemis’ extensive follow-up communication, educational emails, and alumni group all way exceeded expectations and went so far beyond a one-time event. I learned so much from Artemis at this workshop — well beyond the seminar materials and actual training. She’s all about creating a culture of fitness, health & wellness and bringing people together for many years to come!” ~Beverly J. “Everything about the workshop exceeded my expectations!” ~Tracy C.
“Some of the best dollars I have spent in a long time.” ~Lindsey G.
“Not enough words to say how great this workshop is! Thank you so much Artemis for your great teaching abilities… I learned so much.” ~Linda W.
“I really feel like I got a lot out of the workshop, particularly in regards to breathing and “set up” for kettlebell lifts. I used the techniques I learned today and noticed a difference!” ~Sarah W.
“I learned a lot from the workshop. Most importantly program design on my workouts. This was invaluable information to me. I loved learning more about Artemis’ lifting philosophy’ and her drive. I really enjoyed meeting and being around the other women who took part in the workshop too. The mini workouts were probably one of my favorite parts. Artemis is extremely knowledgeable and presents very well.” ~Geraldine Z. 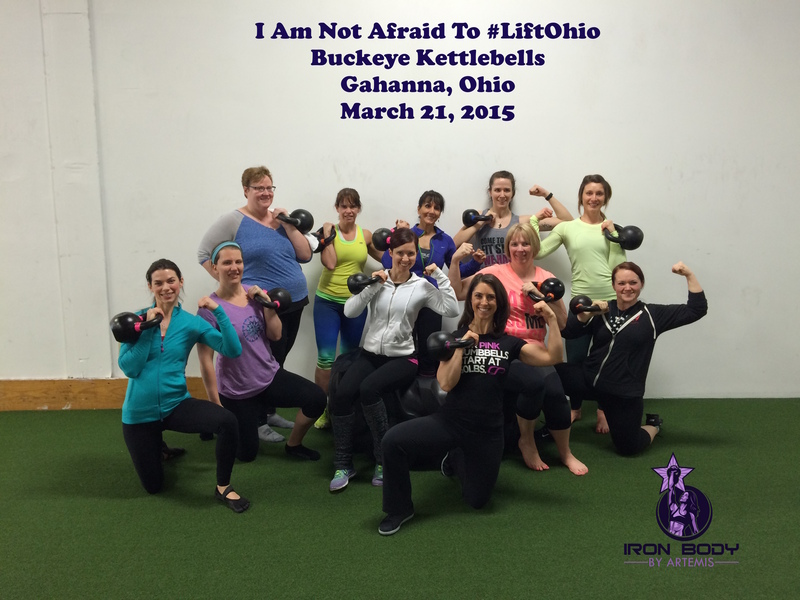 From Email Follow-up Post Workshop: “I did weighted pull ups today and felt so much better mentally & physically. I really needed someone to tell me to “just attack the bar” and “not be afraid to lift”. Your advice was the game changer I needed with regards to where I am going with my training and life in general. I feel like I have a new spring in my step. I’m so glad I came to your workshop.” ~Geraldine Z. “A lot of the movements/exercises were new for me so I really enjoyed the hands on/learning part of the workshop. I feel like I learned a lot and the group workouts were also really helpful. I feel like they helped me to better learn the movements and gain body memory of what we just learned. I really thought this was a great workshop and feel really empowered and excited to include everything I learned in my training. I left feeling inundated with information and feeling inspired. 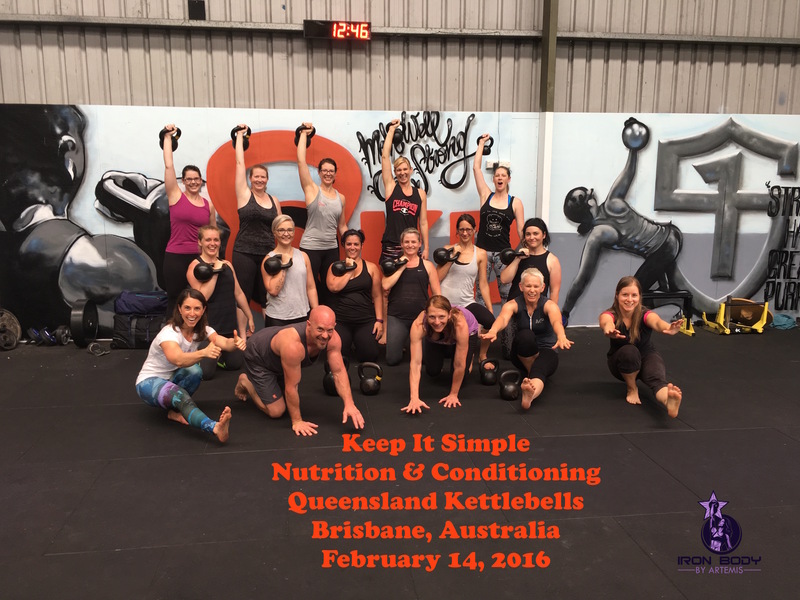 This might be because I am brand new to kettle bells, but either way I thought the workshop was awesome and am glad it exists as a resource for people.” ~Alena K.
“You are such an empowering and inspirational person. I love your approach to teaching where you build people up instead of knocking them down. I like that you also focus on increasing trainees self-confidence. I also like how you share your own personal journey.” ~Michelle S.
“Artemis, thank you for your generosity in sharing your wisdom gained from your successes and failures. Besides the “Ed Grimley” stance to squeeze, I learned that champions don’t run from their failures, they learn from them. I’ve heard that so many times, but never did I believe it until I met you. 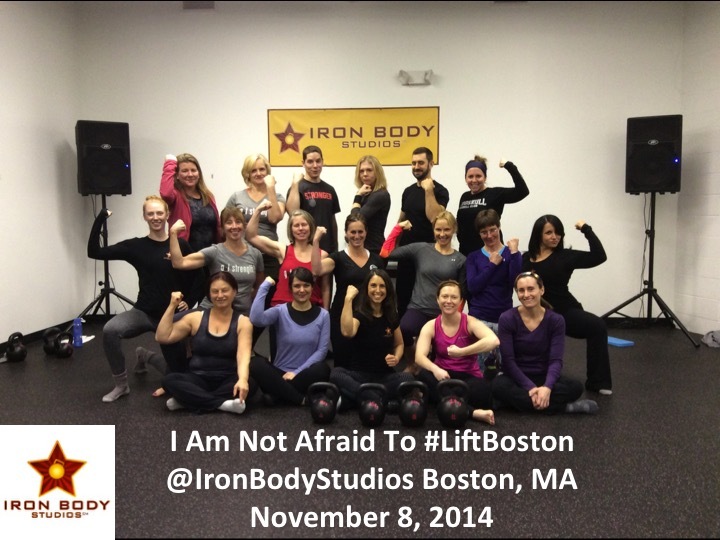 Thank you for your honesty and just being real with us.” ~Andrea H.
“The I Am Not Afraid To Lift workshop was great! Artemis covered well thought out progressions based on experience for beginners and advanced students. More importantly she covered the mindset that limits so many folks. The workshop was fun and packed full of information. Artemis exemplifies the physical and mental strength that can be found in all of us.” ~Rob D.
“I really didn’t expect so many different movements to be covered, and although I was familiar with most of them, I learned something new (from little tweaks to different perspectives) about each one.” ~Sheila C.
“I loved all of the actual physical aspects of the seminar. Getting to practice grinds and ballistics and getting to go trough some ladders and workouts with expert coaching was invaluable!” ~Kimberly B. “My favorite part was doing the pull-ups! I learned new technique that greatly improved my pull-up. Every section however was very in-depth and Artemis was a very thorough and effective instructor. I would never have believed I could do weighted pull-ups if I had not attended I Am Not Afraid To Lift and now I am doing them a few days a week and getting stronger! !” ~Melanie A. “Thank you for an awesome seminar yesterday. I can’t even express how fantastic it is that you are willing to share all of that information and do it so effectively in just a day.” ~Chris T.
“Artemis Scantalides is an amazing person, trainer and coach. She is extremely strong and highly skilled. She has such great positive energy that when you are around her she really brings out the best in you. She is truly an inspiration and one of my role models. I feel very blessed to have been able to attend her workshop and to learn from one of the best. Looking forward to applying all the gems that I have learned.” ~Tara H.
“It was great to see you and Eric in your new facility and to spend the day collecting some great gems to take home. Thank you both for hosting such a great program. I’m jealous of those who live in your area and get to study with each of you on a regular basis!” ~Daniel H.
“I’ve been working with some of the coaching tips from the workshop and less than a week afterwards I got my first hanging leg raise! To the bar, baby! Was a fun PR to hit.” ~Daniel H.
“As a relative beginner to kettlebells (as well as overall fitness in general), I thought the workshop was really helpful in mastering movements, as Artemis explained in detail every step, as well as answered questions about breathing and other techniques for success. Immediately after the workshop, I could already feel a difference in my own training by employing those techniques. In addition, it was great to spend a day with like-minded men and women of all fitness levels, and it was so inspiring to see others reach their own PRs. Overall, it was a great day, and I can’t wait for the next workshop! ” ~Beth H.
“I can’t say enough about the course last weekend. I went in planning to be cautious because of my back pain. I left feeling better than when I started. The tips you, Eric, Michele and Tracy gave to fix my form were so helpful that I noticed a difference right away. I have done 2 days of training since Saturday and already notice some improvements. The follow up emails and pdf’s have been above and beyond. You really have tied it all together and provided some amazing information. I’m excited to keep training and progressing!” ~Laura T.
“I know I’ve used the word amazing to describe this day… probably used it more than once. As you can see I was surrounded by a group of strong and motivated women and men. 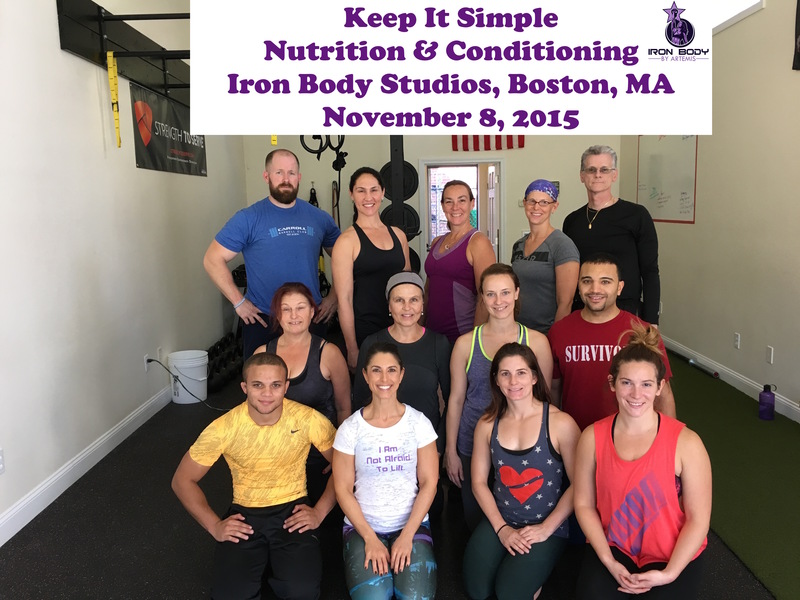 I left this workshop with so much useful information that I have already incorporated into my workouts. I learned what I do well and the many areas I need to work on. I have no words to describe Artemis… she is such a role model of physical and mental strength. A special thank you goes out to Tracy and Eric for their guidance. I really appreciated their help. For me, this is one step closer to my secret (for now) goal. Thank you Artemis, Eric and Iron Body Studios. 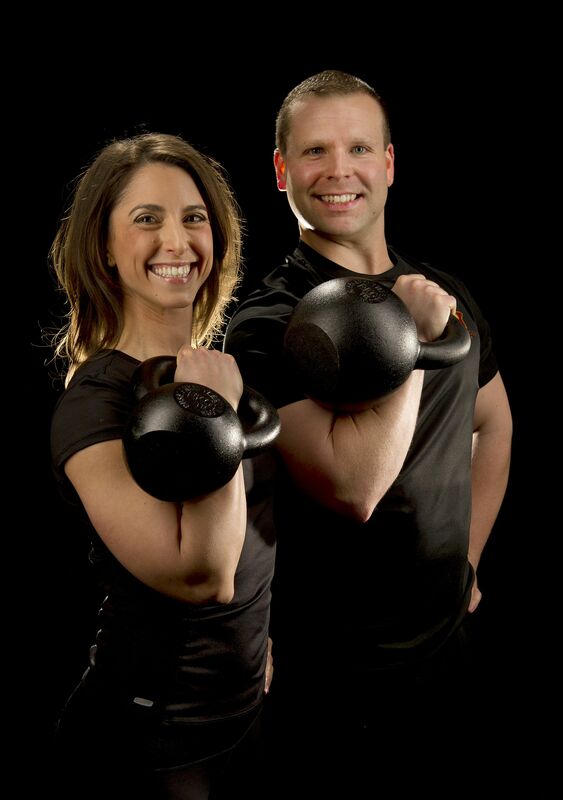 If you want to learn kettlebells, this is the place to train.” ~Patti P.
“My favorite moment? When I just about burst into tears for fear of doing my first (assisted) pull up! I am quite thankful to have taken your workshop, that was a gift that keeps giving.” ~Melanie T.
“I never felt like I couldn’t participate and I came away with so much knowledge and a renewed sense of purpose.” ~Emily S.
“The addition of double kettlebell dead-lifts into my strength training program improved my barbell dead-lift form and technique better than any other assistance drill I had previously attempted. Previously, I did not always load my hips properly and I found myself lifting with my back and leaking tension or simply not creating enough tension to initiate a pull or complete multiple repetitions with good form. Working double kettlebell dead-lifts improved my hip hinge and forced me to generate and maintain maximum tension throughout the entire lift. Standing directly over the bells helped me to better understand how to pull weight while keeping the load close to my body–ultimately making sure that my lats were fully engaged from the initiation of the pull to the completion of the pull. A proper hip hinge, with maximum tension in the lower body, taught me how to sit back into my hips so that they were loaded correctly and made initiating the pull with my hips and not my back or shoulders completely achievable. Essentially, the concept here is that with lats fully engaged and a fully loaded hip hinge, one could sit back and hover the weight off of the floor. And finally, achieving a full lockout at the top of the pull–generating a standing body plank–reinforced the feel of maximum tension and the need for tension before, during, and after every pull. Additionally, the handle size of kettlebells provide an excellent grip training aspect that makes “breaking” a barbell or holding a barbell for consecutive pulls much more manageable. “ ~Jessica V.
Learn more about me and the Lift Workshop in Episode 9 of MFF (Mark Fisher Fitness) Best of Life Radio Podcast. Download for free and listen HERE!